Very few people lived there, but that shouldn’t suggest the place was without activity. By the time of first contact with Europeans, the downtown area of Honolulu, known then as Kou, was comprised of shoreward fishponds and taro lo‘i fed by streams extending into the Nu‘uanu and Pauoa valleys. On the opposite side (ʻEwa) of Nu‘uanu stream was a fishpond, identified as “Kawa” or the “King’s fish pond.” Iwilei at that time was a small, narrow peninsula, less populated than the Honolulu-side of Nuʻuanu stream. The first wharf at Honolulu Harbor was just north of Nuʻuanu Street. It was constructed from an old hulk sunk at the spot in 1825. This was replaced and expanded in 1837. On the shoreline (at about what is now the intersection of Queen and Nimitz) Fort Kekuanohu was constructed. Its original purpose was to protect Honolulu by keeping enemy or otherwise undesirable ships out. Later, it was used as a prison. The Prison was on a marshy no-man’s land almost completely cut off from the main island by two immense fishponds. The causeway road (initially called “Prison Road,” later “Iwilei Street”) split Kawa Pond into Kawa and Kūwili fishponds. Sometimes called the “Oʻahu Prison,” “King’s Prison,” “Kawa Prison” or, simply, “The Reef,” it was a coral block fortress built upon coral fill at the end of a coral built road over the coral reefs and mudflats of Iwilei. In 1886, Mark Twain visited the prison and wrote: “… we presently arrived at a massive coral edifice which I took for a fortress at first, but found out directly that it was the government prison. A soldier at the great gate admitted us without further authority than my countenance, and I supposed he thought he was paying me a handsome compliment when he did so; and so did I until I reflected that the place was a penitentiary”. The Prison was later relocated to Kalihi (1916) and renamed O‘ahu Jail; this is now known as O‘ahu Community Correctional Facility. Another Iwilei activity included a railway station. In 1889, a group of businessmen led by Benjamin Dillingham founded the O‘ahu Railway and Land Company (OR&L). The railroad carried sugarcane from the plantations to Iwilei – it carried people, too. To accommodate this, the marshes and fishponds were filled in and new wharfs built. By 1901, the OR&L and other business interests had created about 500 acres of waterfront land. The docks could accommodate over 20 deepwater sailing vessels, unloading coal and loading sugar. As time went on, more of the fringing reefs were filled, which made way for expanded commercial use. By the 1920s, small and large businesses moved in – and, now, gone are the Prisoners, Pullmans and Prostitutes from Iwilei. 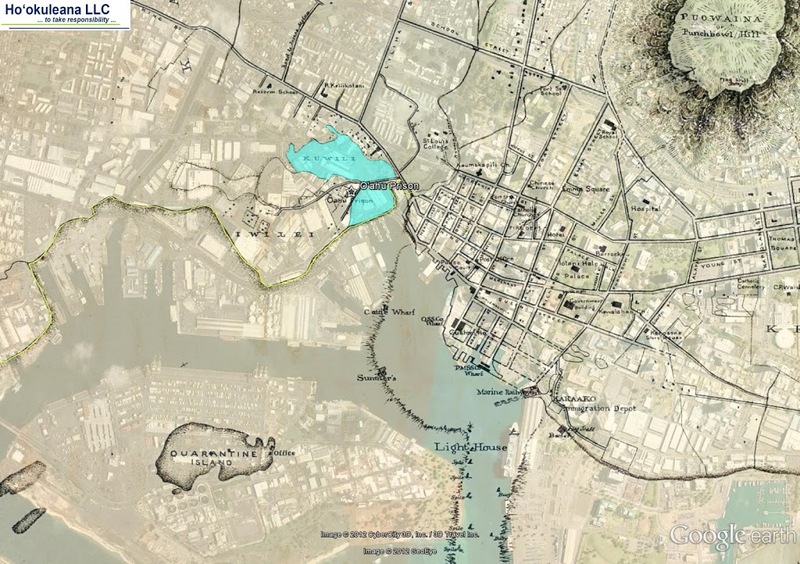 The image shows the Iwilei area from an 1887 over Google Earth; Oʻahu Prison and the Kawa and Kūwili Fishponds are noted. In addition, I have added other related images in a folder of like name in the Photos section on my Facebook and Google+ pages.